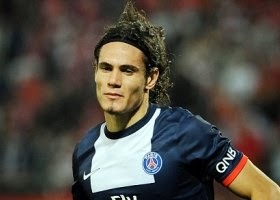 Sensational transfer news are out claiming that Arsenal have made an ambitious bid to sign unsettled PSG striker Edinson Cavani. The Daily Star revealed that reports in France claim the Gunners are interested in bringing the former Napoli man to England after learning of his discontent at the Ligue 1 champions. The Uruguay international is reportedly not satisfied at having to play in the shadow of Zlatan Ibrahimovic and has made initial enquires over his potential suitors should he leave in the upcoming January transfer window. The Premier League side have enquired into the possibility of signing Cavani in the new year as Arsene Wenger looks to bolster his strike-force, but have baulked at his £135k-a-week wages. Chelsea and Manchester City are also interested in the Uruguay international.